Well I’ve officially “moved” from the hills of western mass back to my home town near boston. My house is still on the market so my feet are still somewhat tied but on a weekly basis I’ve begun working my new jobs and living out east full time! It’s WONDERFUL to not have to drive back and forth across the state every other day and I believe most of the craziness has past but there is still so much that I need to organize and settle into. So far I am LOVING my new jobs as a coach at Crossfit Tri County and a waitress/bartender at an awesome super busy restaurant in Dedham. I’m on track to enroll in the Nutritional Therapy Practitioner course through the NTA starting in February which has been on my to-do-ASAP list for far too long, my new living situation and job flexibility will allow me to finally continue my education in the field I am most passionate about. Now, enough of that, back to the reason why you’re here: here’s a super easy and festive recipe you can whip up to bring to your next holiday cookie swap or party. Enjoy! Fall… aka #PieSeason! This is the time where I feel terribly for anyone with a pecan allergy, because pecan pie is literally one of the most delicious desserts ever created (in my opinion). These tartlet variations aren’t the most cut and dry of recipes, but one batch makes quite a few and I love being able to grab one here and there versus the looming pie-left-must-eat feeling you get when you try to slowly work your way through a full sized pie. It’s also pretty much guaranteed that these will be scooped up quick at any holiday party as well because they are so *cute* and no one wants to be the first person to cut into a perfectly untouched pie. In the recipe I use fancy little tartlet pans but you can also use a cupcake (or mini-cupcake) pan as well. Enjoy! -In another small bowl mix together melted coconut oil, maple syrup, almond milk and vanilla. -Add wet ingredients to dry ingredients and mix until thoroughly combined and no clumps are left. -Cut 2 inch squares of aluminum foil and then make one cut to the center of each square. Place a piece of foil into each tartlet pan pressing down gently. -Fill each mold with a weighted object that wont cook in the oven- I use raw beans. -Bake for 12-14 minutes or until a light golden brown appears on the crust. -Remove from oven, carefully remove the foil with beans and let the shells cool for about 5 minutes. -Using a toothpick gently reach into the edge of the crust and pan and start to loosen the tartlet on 2-4 sides. *Sometimes these pop out pretty quickly and sometimes they take some patience and TLC. I’ve found that there seems to be an optimal time to remove these from the pans but have no fear you will learn quickly when they are ready and when they are not. -While the tartlet crusts are coking you can start the filling. -In a sauce pan over low heat combine maple syrup, coconut oil, almond milk and vanilla. Remove from heat when melted. 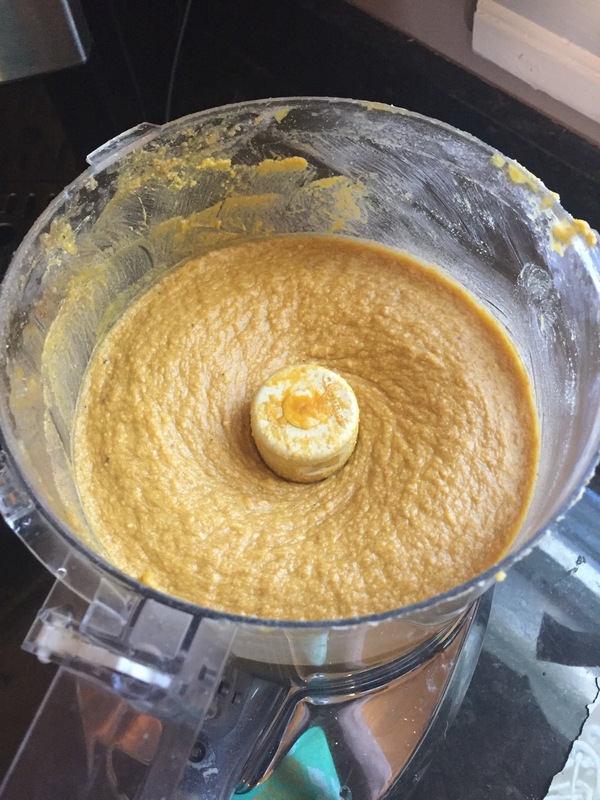 -Add soaked dates,maple syrup mixture and salt to a food processor and process until smooth. -Move mixture back into cooled saucepan (or another bowl but I like to minimize my clean up time) and add in finely chopped pecans, stirring until well combined. -Add one spoonful of filling to each cooled tartlet then carefully place halved pecans in a star shape. Enjoy these warm or store in the fridge (14 days) or freezer (up to 3 months)! Fall is my all-time favorite season. Apple picking, pumpkin carving, watching the leaves change colors, brisk mornings and evenings, what’s there not to love! Well- in my opinion- the sugary, artificial “pumpkin spice” everything is a bit overkill. 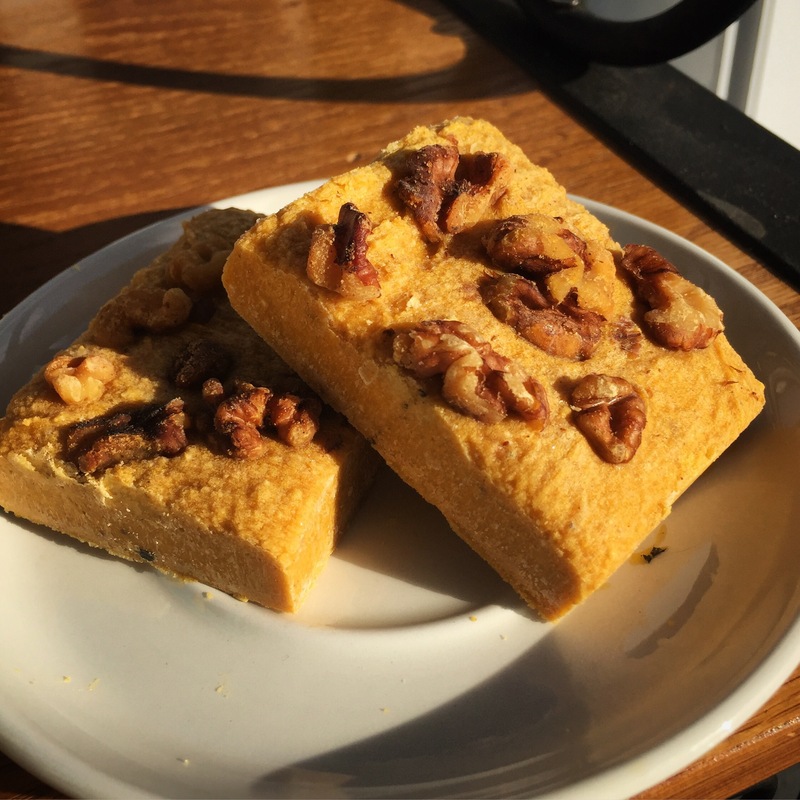 Pumpkin is a squash and therefore it’s not inherently the sweetest ingredient for baked goods but it is easily complimented by natural sweeteners to make some delicious, nutrient dense treats. 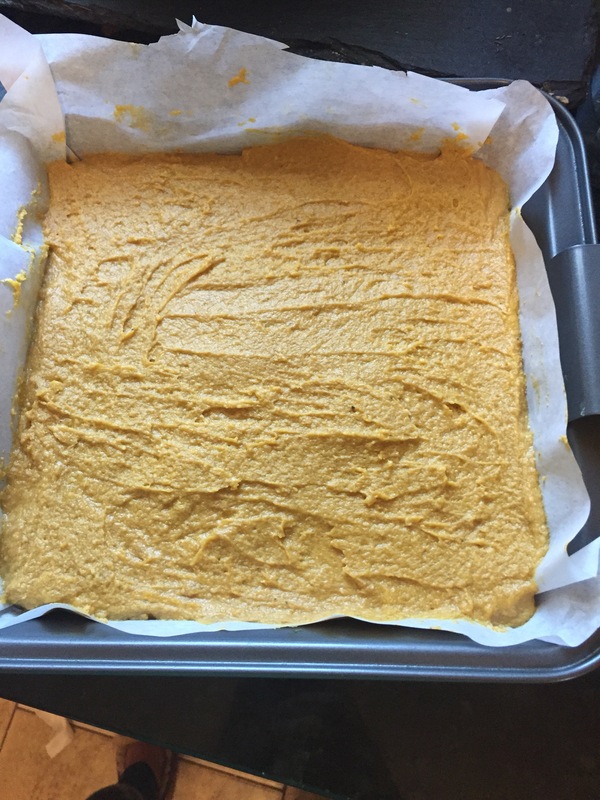 Pumpkin pie is probably the most common- but this freezer fudge is definitely a new favorite of mine. The recipe is quick and easy and it’s sure to please a wide array of audiences. Try it for yourself and let me know what you think! 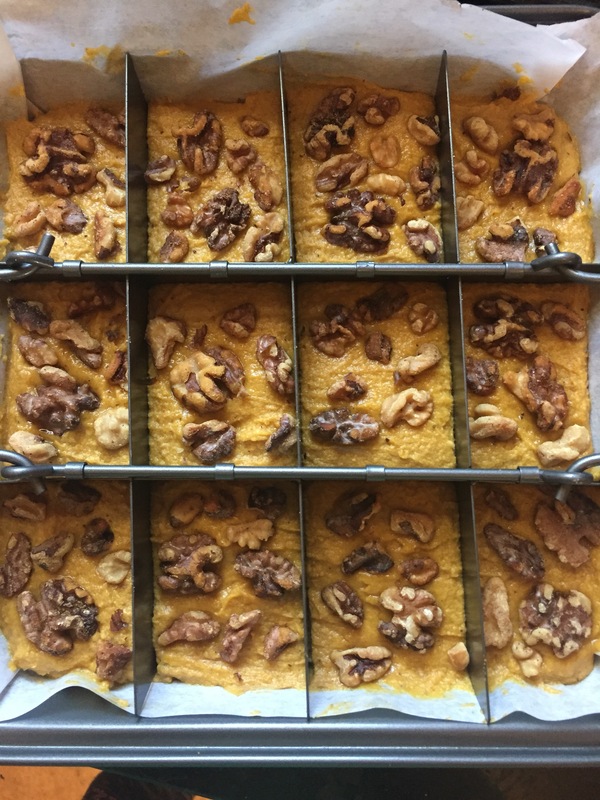 -Line an 8×8 pan with parchment paper. -Add all ingredients except the walnuts into a food processor and process until smooth. -Pour the mixture into the prepared pan, use spatula to smooth. -Sprinkle walnuts evenly over the mixture and freeze for an hour or until firm. -Remove from freezer and let sit out for 5 minutes before cutting into squares. I typically cut and then individually wrap each square and place them back into the freezer to grab whenever I need a treat! These are best eaten within 2 weeks if stored in the fridge or freezer.